ISM met with the founder of al-Khalil’s largest women’s cooperative to discuss business, the occupation and women’s empowerment. Idhna is a small town to the west of al-Khalil, located less than a kilometre from the separation wall that divides Israelis from Palestinians. 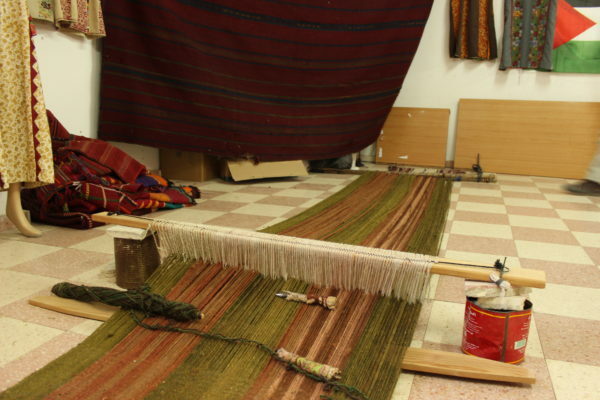 It is also home to the main workshop of Women in Hebron, a women’s cooperative which provides an independent source of income to 150 women in nearby villages. The workshop is a simple four-room ground-floor apartment, with traditional weaving machines as well as modern sowing machines. 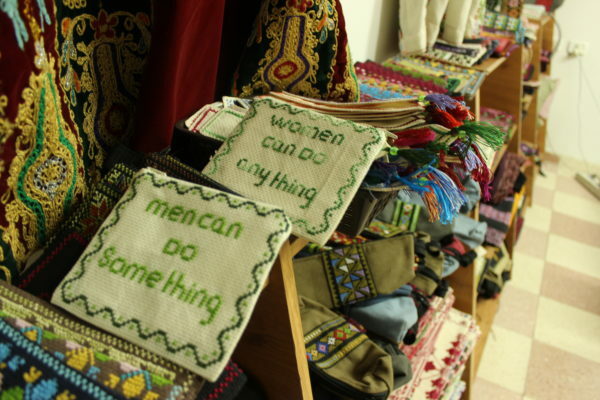 The walls are lined with examples of the women’s work; patterned rugs and delicately designed dresses sit alongside hand-made wallets and pillowcases. 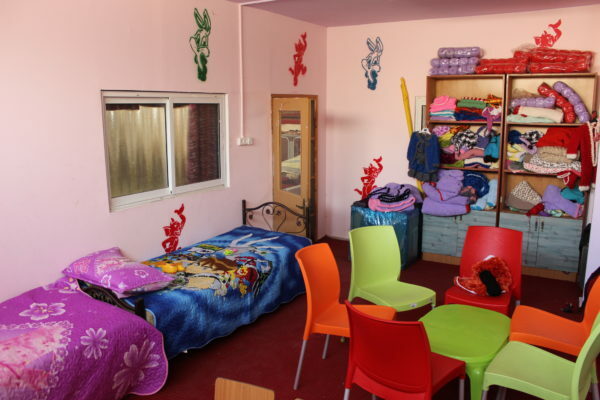 There is even a room just for children’s clothing, which includes a crèche for the women’s children to sleep in as they work. Nawaal is the founder of the cooperative, a middle-aged Palestinian woman from the area. Her gentle voice belies an energetic and determined temperament. Not content with her role in helping to coordinate the women’s work, Nawaal takes it upon herself to travel Europe and east Asia in order to spread awareness of the occupation, and to find a market for the women’s products. Tourism in Palestine declined sharply after the Second Intifada ended in 2005. The construction of the apartheid wall discouraged both domestic and international tourism, and those that do continue to visit are more likely to come on short day-trips, giving little to the local economy. The decline in tourism is just one part of the economic sabotage Palestinians have been subject to by the occupying power. Roadblocks and checkpoints impede freedom of movement, while settlers vandalise Palestinian farms and the Israeli government deliberately restricts access to basic services like water. It was in this context that Nawaal chose to set up Women in Hebron to provide an independent source of income to local women, most of whom would not be able to find employment otherwise. ‘They don’t have university degrees, but all the women in the villages know embroidery – it’s traditional here’, she explains. 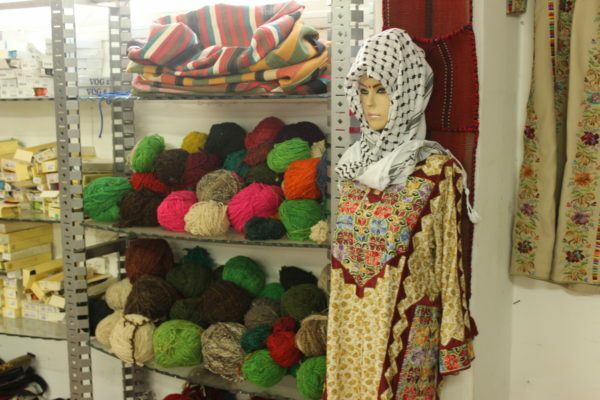 It took three years until other women began to join, but now there are over 150 women producing items for their store in central Hebron. Working in a cooperative rather than a traditional business allows the women to retain the full product of their labour. By contrast, many factories in the West Bank are owned by Israelis, with workers sacrificing a significant portion of their work to the profits of the, usually male, owner or shareholders. These profits are then sucked out of the Palestinian economy, contributing to a state of neo-colonial dependence which would threaten even an independent Palestinian state. While the cooperative only employs 150 women so far, it has a significance far beyond the villages of the al-Khalil area. By integrating women who would otherwise remain unemployed into the labour market, the cooperative helps to liberate them from financial dependence within the family. By giving these women full ownership of their product, the cooperative helps to liberate them from financial dependence on factory-owners, who might hire or fire them at a whim. By dividing profits amongst the workforce, the cooperative keeps the money in the Palestinian economy, helping to build a viable Palestinian economy that serves as much more than a source of cheap labour for Israeli factory-owners and a market for Israeli products. Nawaal recognises this wider importance of the cooperative, and has been in contact with feminist and socialist organisations in Europe. Though she is grateful for the steadfast support of the Palestinian Solidarity Campaign, she is hoping to find broader support among the European left. Nawaal plans to speak at Feminism in London this October, and is considering a visit to the Durham Miners’ Gala in July. She hopes that bringing along Palestinian children to speak alongside her will help awaken her European audience to the reality of growing up under occupation. Women in Hebron’s main store is in al-Khalil’s Old City, run by Nawaal’s friend Leila. Even at the best of times, al-Khalil is not an easy place to grow up. The city is home to 300-500 settlers, who are protected by 1,200-2,000 soldiers and border police at any one time. 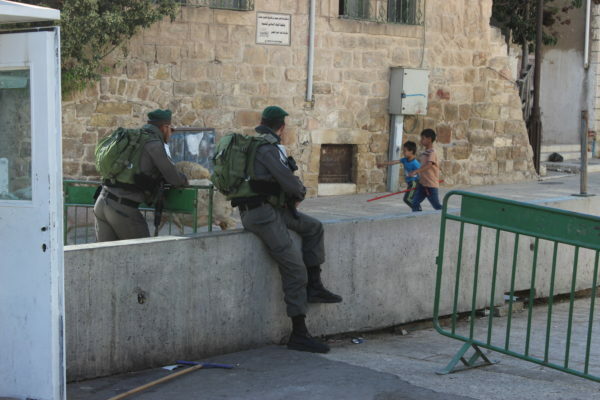 Twelve checkpoints dotted throughout the city put children in daily contact with soldiers, while routine armed patrols and frequent raids and manhunts see them frequently harassed, beaten and detained. 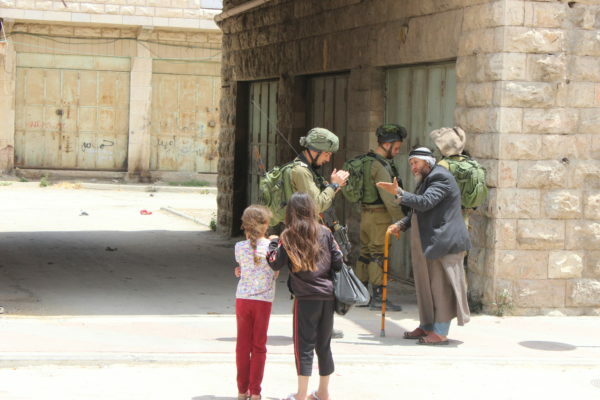 The settlers are no better, with Palestinians suffering harassment, intimidation and sometimes violence. A local settler who murdered 29 Palestinian worshippers, including children, in 1994 is buried in the town, and his grave is still visited by settlers who consider him a martyr. The former leader of the fascist Kach party, which supported the massacre, is a local resident. 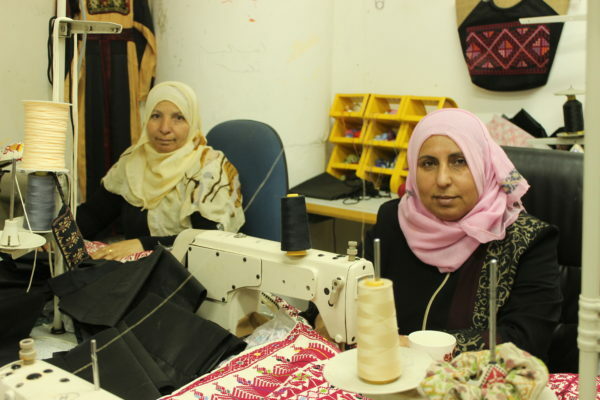 Unlike other cooperatives, Women in Hebron do not receive sponsorship from the Palestinian Authority, as they are based in the villages rather than the city. Nawaal is not concerned about this, however, and says that the women are proud of their independence. What is more of a concern to her is local corruption. Tour guides, including both locals and Europeans, have been demanding a 30% tribute from vendors in the Old City, with the threat that they will keep tourists away from shops that do not pay the fee. Nawaal says that the pressure from this form of corruption is causing great financial troubles for the cooperative. The combination of financial pressure and the need to spread awareness of Palestinian experiences of occupation and methods of resistance have led to Nawaal’s decision to tour the UK this summer. If she can get a visa, she hopes that her visit can bring some much needed outside support to al-Khalil’s largest women’s cooperative.